Explain why you are the best candidate for the office you seek and highlight a position held by your opponent that you admire. I have committed my life to serving our community both as a classroom teacher and working for my constituents in the Kansas Legislature. I have a proven record of standing up against Sam Brownback’s reckless agenda and only supporting policies that are best for all hardworking Kansans, not just a prosperous few. I will continue to work hard to reduce sales and property taxes, provide fair funding of public schools for all children, and create jobs with investments in infrastructure projects and the growing fields of technology and clean energy. Kansans need leaders who will move the state beyond Brownback. They do not need or deserve to be represented by those who will rubber stamp Sam Brownback’s ongoing failed policies. I admire that my opponent is a young entrepreneur, starting his first business at the age of 16. Outline revenue and spending changes you support to eliminate the state’s structural deficit. Be specific in setting out your tax and budget reforms. I opposed Sam Brownback’s unfair tax experiment that eliminated income taxes for 330,000 business owners while wage earners continue to pay. The news media has reported that small business owners across the state say they believe it is unfair that they don’t have to pay income taxes while their employees do. Kansas needs a tax policy where everyone pays their fair share. I also voted against Brownback’s agenda that imposed the largest tax increase in our state’s history, resulting in the highest sales tax rate on food in the nation. These increases came on top of already-rising property taxes. This is why I sponsored legislation to gradually eliminate the sales tax on food and provide for local property tax relief. Finally, I’ve stood up against Brownback’s repeated raiding of KDOT and KPERS to pay for the ongoing budget crisis caused by his failed policies. I voted for the 2010 highway plan which was estimated to create 175,000 jobs. But, now, the loss of KDOT funds has delayed projects and halted job creation. I’ve opposed using KPERS like a credit card. Delaying payments to KPERS costs the state more than $20,000 a day in interest alone. This is not sound fiscal management. As your State Senator, I pledge to continue fighting for a fair, balanced, and sustainable tax system that provides relief first and foremost to middle-class families and Kansans living on fixed incomes. I also pledge to invest in schools, infrastructure, and critical services for Kansans. Only then can our state recruit and retain quality job creators. How would you modify the Kansas Open Records Act and the Kansas Open Meetings Act to improve the public’s access to work of government officials in Kansas? I’ve already worked on several bills related to improving the public’s access to their government. I introduced a bill banning the use of private email accounts by public officials to conduct official public business. I also sponsored legislation requiring the governor to release the names of applicants to the Kansas Court of Appeals, which he refused to do so. In addition, I supported legislation requiring the nominating commission for Supreme Court justices to comply with the Kansas open meetings and open records act. These three bills passed with bipartisan support. While the people of Kansas can listen in on House and Senate floor debates, I will continue to support legislation that expands live audio streaming to all committee rooms in the Statehouse. This would allow Kansans to listen in on public hearings, debate, and voting during committee meetings. If you were writing a bill to enhance public safety across the state, what would be three features of that legislation? I plan to re-introduce Senate Bill 338, which was passed last session, but vetoed by Governor Brownback. This bill would allow cities and nonprofit organizations to petition the district court to possess abandoned property temporarily for rehabilitation purposes. It would apply to property that is unoccupied continuously for 365 days and has a blighting influence on surrounding properties. The petition filed by the city must contain the property’s history regarding utility service, property tax payments, code violations and efforts by the city to remedy those violations, and attempts to notify the last known owner. The bill also allows the court to give the homeowner, if known, additional time to comply with all applicable codes and pay delinquent property taxes. Despite the Governor’s veto, this bill is strongly supported by Topeka’s neighborhood improvement associations. Many neighborhoods are affected by unsafe, abandoned houses owned by absentee landlords. The bill would give the city of Topeka and nonprofits greater enforcement authority over cleaning up blighted housing. Articulate your strategy for folding citizens without adequate access to health care into a system in Kansas that provides for their physical and mental well-being. I am very concerned that more than 150,000 Kansans are without health care because of Governor Brownback’s refusal to expand Medicaid. That is why I strongly support the Kansas Hospital Association’s plan to expand Medicaid, which will provide more access to healthcare, create thousands of jobs, and protect rural hospitals from closing. In addition, I believe the legislature needs to address the staffing shortages and employee morale issues at our state hospitals. We should reduce overtime by increasing staff and giving a cost-of-living pay increase to current employees. Chronicle what you believe ought to be the central elements of a new school-finance formula for public schools in Kansas. As a classroom teacher for the past 41 years, I have had first-hand experience in what the legislature must do to improve the quality of K-12 education in Kansas. I believe the previous school finance formula was fair and proven, but it was underfunded. Governor Brownback and his allies unnecessarily repealed this formula and replaced with a two-year block grant system. After the block grants passed, I proposed an interim study committee be established to study school finance formulas from other states as well as the history of school finance in Kansas, including judicial decisions and recommendations of previous task forces or commissions. While an interim committee was established, it failed to develop a new formula. In creating a new formula, the legislature must give local school boards the certainty of funding on a multi-year basis and refrain from imposing any unfunded mandates on school districts. Employee compensation, staffing, and curriculum decisions should be left solely to the local school board in partnership with employees, parents, and patrons, particularly local business people. A new formula must adhere to the individual needs of students. Funding should be available to reduce the achievement gaps for poverty and non-English speaking students. 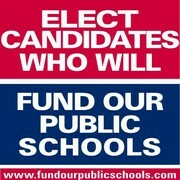 Special education also needs to be fully funded. The difference and disparity in wealth of each school district’s tax base must also be taken into account in a new formula. For example, for the 2015-2016 school year, one mill of property tax in USD 499 Galena raises $17,338, or $24 per student, while one mill in USD 244 Burlington raises $449,704, or $550 per student. School districts that are very small by necessity must have access to distance learning opportunities that require significant investments in technology. A new formula should make provisions for the varying transportation needs of all districts. Do you support a state requirement that all Kansas law enforcement officers wear body cameras? I support the use of body cameras, however, not as a state requirement. I believe community members, locally elected officials and law enforcement officers working together would better resolve this issue. Will you vote to modify or repeal the 2012 state tax law providing an income tax exemption to owners of businesses formed as an LLC? YES. This law, which was proposed by Governor Brownback, is inherently unfair. The news media has reported that small business owners across the state say they believe it is unfair that they don’t have to pay income taxes while their employees do. Kansas needs a tax policy where everyone pays their fair share. Are you a supporter of government requirements that children be vaccinated for preventable diseases? YES. Have you ever voted for a candidate for public office who represents a political party other than your own? YES. Do you believe the state should adopt an increase in the minimum wage? YES. Do you favor ouster of more than one member of the Kansas Supreme Court subject to retention vote on the November ballot? NO. In terms of biographical information, please provide an outline highlighting your personal employment, public service, volunteerism, education, family, age and a hobby. I am a lifelong resident of the 19th Senate District, which is comprised of eastern Topeka and Shawnee County, western Douglas and Jefferson counties, and all of Osage County. I am a 1971 graduate of Highland Park High School, a 1975 graduate of Washburn University, and I hold a Master’s degree in Special Education from Kansas State University. I’ve been a classroom teacher for 41 years, with 32 of those years spent teaching special education at USD 501’s special purpose school, Capital City. Currently, I am a U.S. government and history teacher at my alma mater, Highland Park High School. I have served in the Kansas House of Representatives (1977-1992) and the Kansas Senate (1992-present). Throughout my years of public service, I have been dedicated to improving the quality of education, tax fairness, access to affordable health care, safety in the workplace, job training and fair wages. In addition, I have worked for better community-based services for disabled, mentally-ill, and aging Kansans. Coaching little league and American Legion baseball has been one of my hobbies over the years. I serve on the board of directors of the Topeka Baseball and Softball Association (formerly Highland Park Baseball). Another hobby is collecting political memorabilia. My wife, Deborah, and I have a daughter, Katie, who is an assistant principal in the Topeka school district. Katie and her husband, Jason, have two daughters, Brighton and Lily. They are expecting a third daughter in December. You can view the published responses here. AFT-Kansas proudly endorses Senator Anthony Hensley for his longstanding support of State, city, and county employees, university employees, nurses, and teachers. 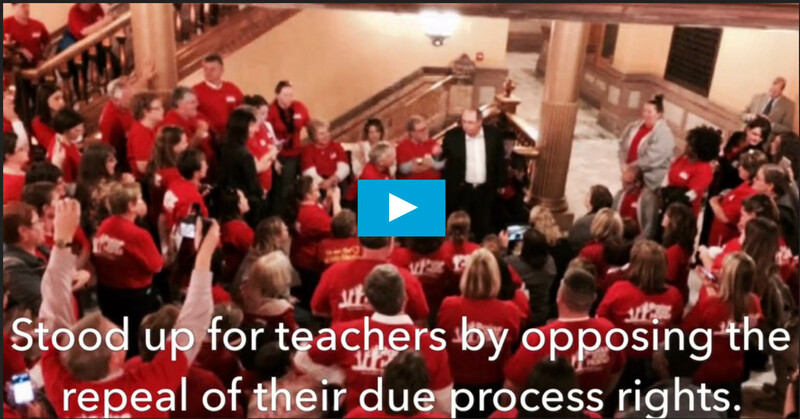 Several public employee local unions are part of AFT Kansas, including but not limited to, KOSE, United Teachers of Wichita, City of Topeka, GTAC, and Kanas University Nurses’ Association. Click here image above or here to view the video. Classroom teacher for 40 years. Spoke out against Brownback’s historic cuts to K-12 education. Stood up for teachers by opposing the repeal of their due process rights. Fought against Brownback’s repeal of a fair and proven school finance formula. Called for a special session to ensure schools remain open. Helped develop a real solution to provide equity for school finance. Paid for by Hensley for Senate, Tim Graham, Treasurer. 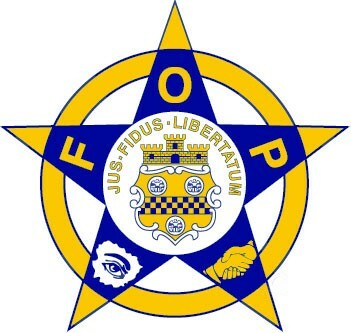 The Friends of Police PAC, Lodge 3, representing members of the Topeka Police Department and Shawnee County Sheriff’s Office endorse Anthony Hensley for Senate District 19. Thank you for completing your questionnaire. We are pleased to offer you our endorsement in your upcoming election on August 2nd. You are free to use our endorsement in your campaign materials and ads. The endorsement is good through the primary election. Candidates receiving a general election endorsement will be notified in late August. We will be directing our members to volunteer for campaigns of our endorsed candidates. As endorsement is not necessarily a commitment for a campaign contribution. We thank you for your willingness to seek office and stand up for public education in Kansas.